Edmund's dev blog for gay nerds: Meat Boy comics on sale! Meat Boy comics on sale! 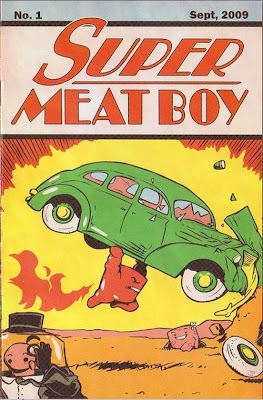 We finally got around to setting up the Super Meat Boy press comics in our etsy shop this week. Each comic is signed by Tommy and myself, comes with 2 stickers and sell for 7$ (and if your lucky a button as well). The comic is 12 pages long, 5.5 x 8.5 in, full color gloss with card stock cover. Originally made to hand out to press to announce the game "Super Meat Boy issue 1" was printed in Sept. 09. and limited to 1,000 copies and given out as a price on our weekly contests on twitter. Once the comics are sold out this issue will never be reprinted, we will be printing a new issue closer to GDC, but once the current issue is gone its gone for good. That's me from the SMB blog, wanna doublebrag about getting the last two copies... Yay! Thank you guys!